In a time when certain conversations can seem tense or even taboo, we push back against a culture of silence. Every other week we sit down with a different guest each week to talk about what they believe, what shaped it, and why it matters. 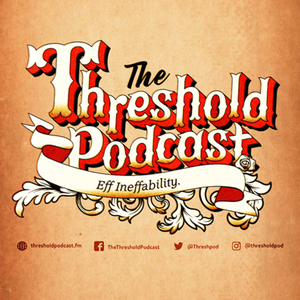 The Threshold Podcast features a mix of conversations with atheists, agnostics, Catholics, other Christians, and people of completely different faith backgrounds. The focus of our conversations is not to challenge, convert, or shame anyone's perspective. Instead, we want to provide a space where people can share their stories, talk about their experiences, and create bridges of trust. Most importantly, we want to step beyond the threshold of banal conversation and talk about the primary thing that we feel should define any person's actions - what they believe. I also take a few minutes each episode to sit down with Fr Colin, MariVi Deliz, Gabby Banzon, or a guest cohost and discuss how the interview impacted us, and to hear what our listeners thought of the conversation, and what value these stories and witnesses bring into their lives. If you would like to be a guest on the show please email us or follow us on Facebook, Twitter, or email us. Join us each week where we eff ineffability and talk about what really matters.